This entry going to be Super Long...I learned my 'Chongheiness' from my ex Boss. 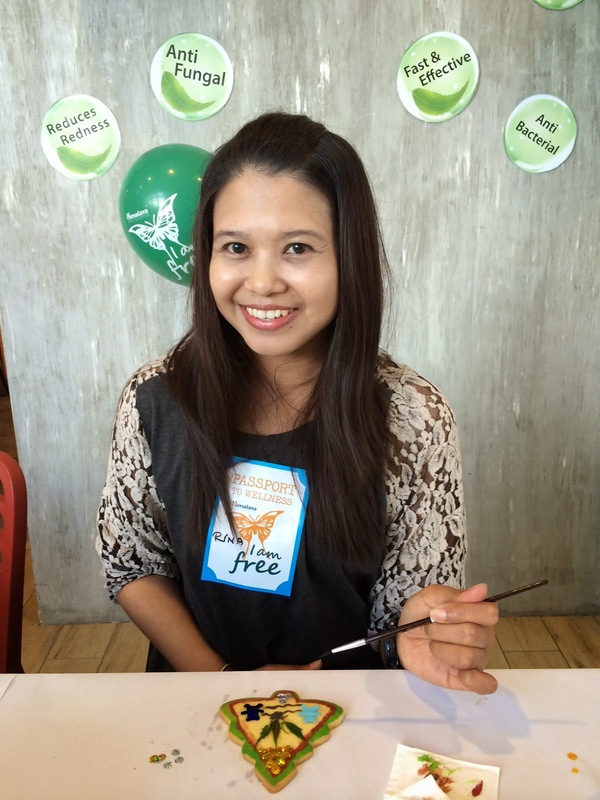 I am one of those lucky Caterpillars of The Butterfly Project to be invited for Himalaya - Neem Product range review at Fuwa Fuwa Bakery, The School, Jaya One, Petaling Jaya on 2nd Aug 2014. First time at The School and I reached there quite early around 9:30am and the event only start at 10:30am. I saw many boyfriends and hubbies pushing the trollies and lifting and pulling luggage of pre loved items of famous amos , hot and spicy bloggers who were there setting up stalls call Pop Market to let go some some of their personal items. Me the less hot and less spicy blogger was lucky enough to be invited by The Butterfly Project who gave me chance to build up my own name and try my best to brag as details and informative reviews to share with public. I treat this as my job and passion. Thank you!!! So I will try my best!!!!! Himalaya is not a strange brand to me. 15 years back!!!! 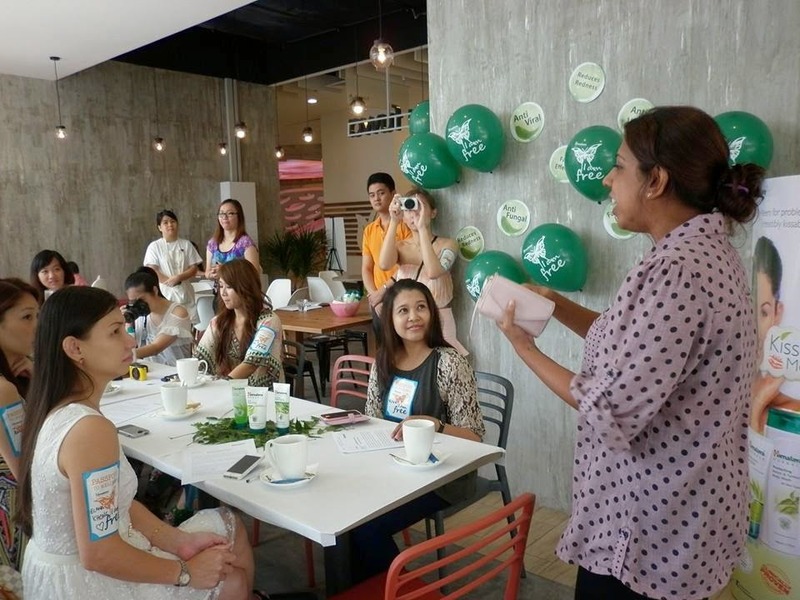 Himalaya with some pharmacy used to organise those health workshop to promote their brand awareness on supplement products. Either it is a free one or with a small registration fees of RM10. Himalaya were so generous to give out shampoo and full sized supplement. I love their garlic supplement and some supplement for blood circulation. I even introduced this brand to my parent and siblings. Mum still using Himalaya Protein Shampoo and my last sis still using Himalaya hair cream. I still faithfully using Himalaya body lotion. 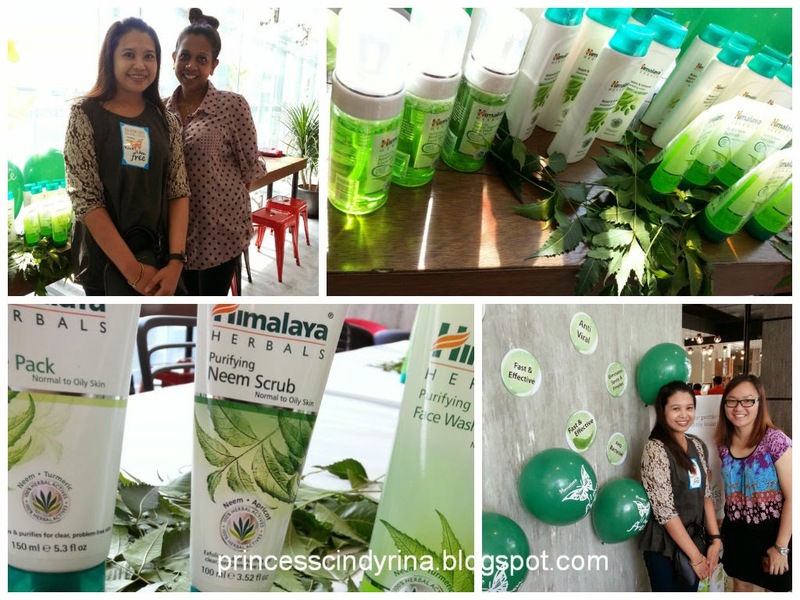 I love Himalaya product because they use 100% herbal ingredients. 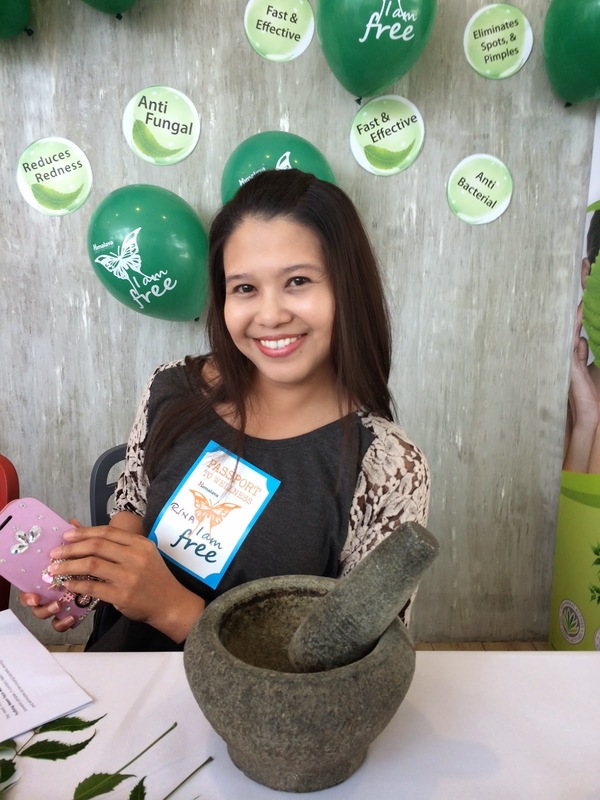 This event, specifically to introduce the NEEM range. 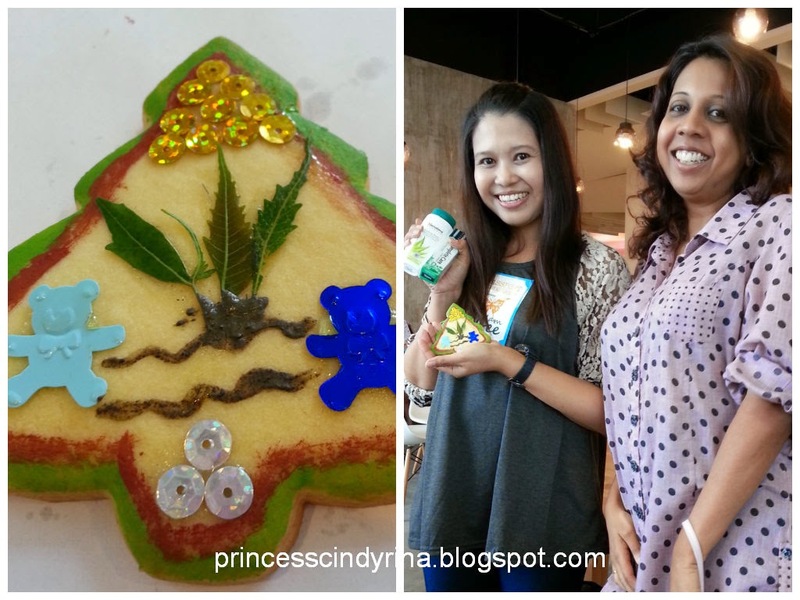 If in Malay, NEEM is 'DAUN SEMAMBU'. 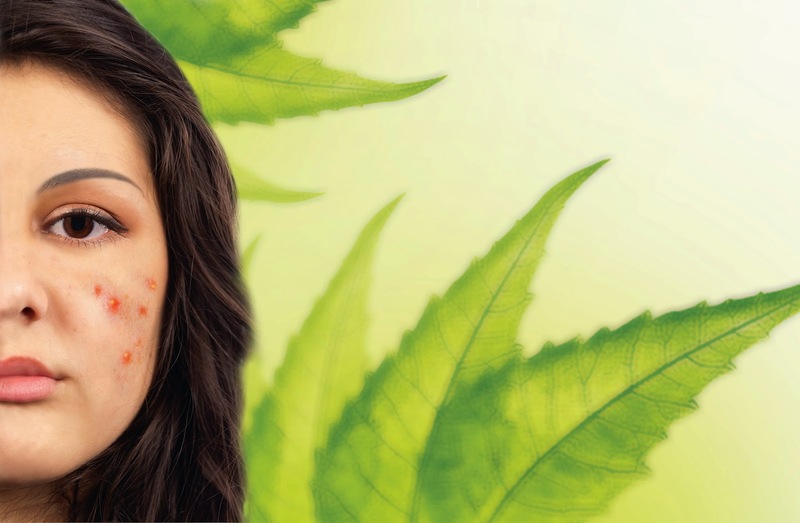 Normally , we use NEEM leaf to reduce itchiness when we have 'Chicken Pox'. In India, NEEM tree like a coconut tree here in Malaysia, is fully utilised in every part of the tree. NEEM leaves, flowers,seeds,fruits,roots and even its bark have been used for treatment of inflammation,infection,fever,skin diseases and even dental disorders. ish ish ish...so useful to that extend. It doesn't stop there if garlic can be used to scare off dracula....Neem Leaves can scare away the evil spirit!!!! Cast the Casper away!!! My split personality disorder syndrome suddenly come out. Next life...I want to be born as NEEM TREE!!!! WTH!!! I found fuwa fuwa the bakery. Ah! I am at the right place. I saw few Himalayan arranging something for the event and the banner right in front of the bakery and the balloon deco too...double tripple confirmed..I am at the right place. I reached quite early...looking at the event location from far. Dare not step in being the first blogger to enter into the event venue. I opt to check out The School awesome toilet first....kekekekeke...so retard of me! Back from toilet...walking slowly to kill times...aishhhh...I don't want to be the first one. Pray hard for somebody to enter first. ah! damn!!! me and my flat shoes and this pregnant lady blouse??? Otteoke!!! She look super gorgeous to me and the way she stride in and the way the PR lady Ms Shireen greeted her like VIP. huh! she must be super duper famous blogger. Ah! WTH!!! 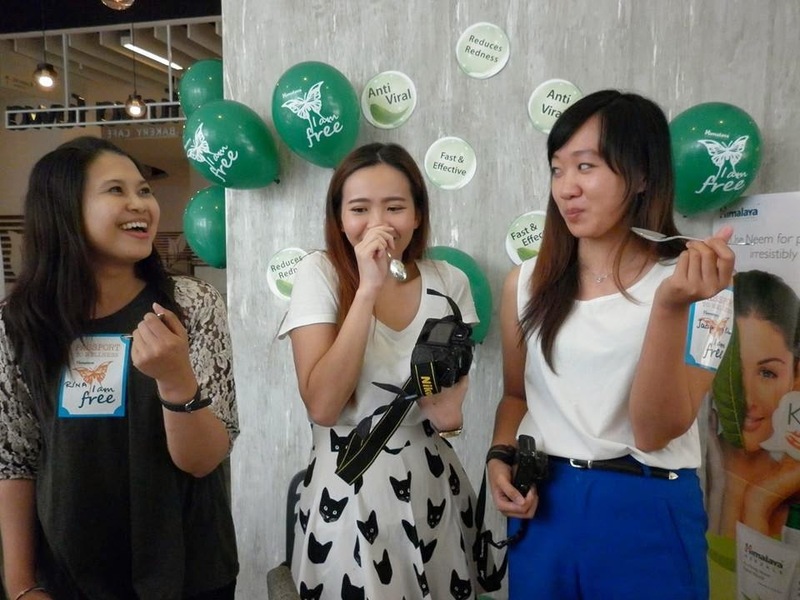 just walk in with hesitate phase and be the second blogger reached the event place. I was greeted warmly by Ms Shireen. Now my confident level increased!!!! WTH! While waiting for other Caterpillars to arrive. 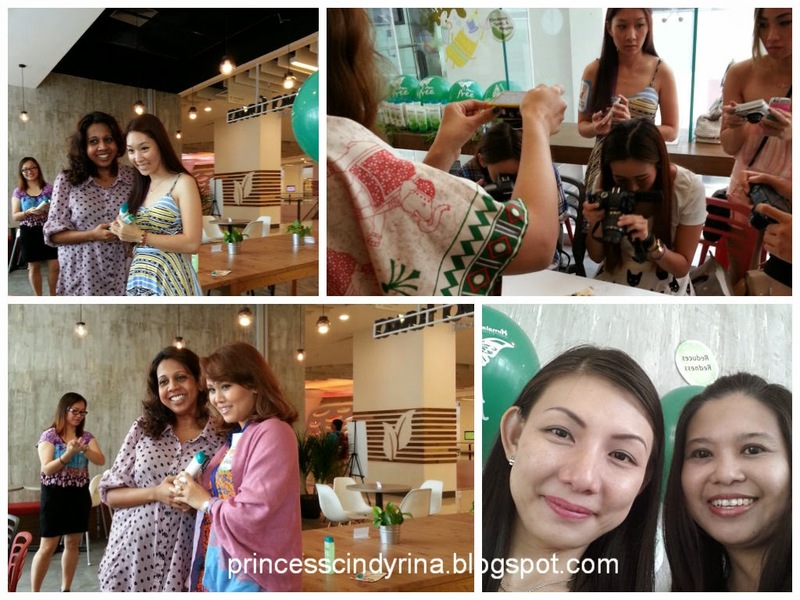 Me mingle with nice and lovely PR lady, from Sugar and Spice Communication, Ms Shireen and Ms Siew Woon, the Assistant Product Manager for Himalaya. Best to be the earliest is to have opportunity to snap more nice photos. Yeah! my bad photography skills...if you give me all the times on earth also....this is the end result I can produce. isk isk isk....WTH!!!! Siew Woon keep telling me that she met me before and my face are too familiar. huhuhuhuh..that because I have common 'red bean pau' face! 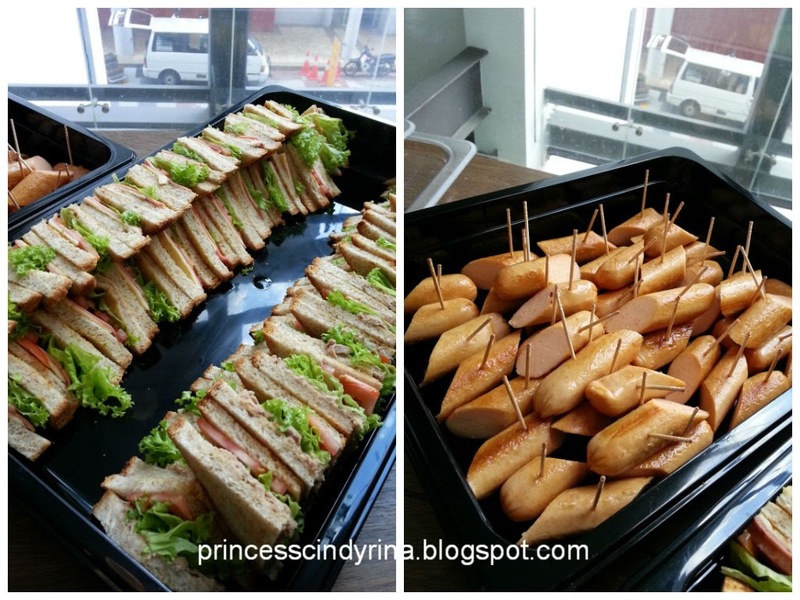 There is another blogger who says my 'red bean pau' face look familiar too. WTH!!! This is how the famous people feel when they are being recognize in public??? Owwhhhhh!!!! me the 'red bean pau face' feel so famous!!!! WTH! Let us sing together the song of Josh Groban...Caterpillars...after me...so confident huh..this young gentleman. I thought he is going to strip tease and I am glad I am standing right before him. WTH!!! This is also the real Josh ...yup!!! 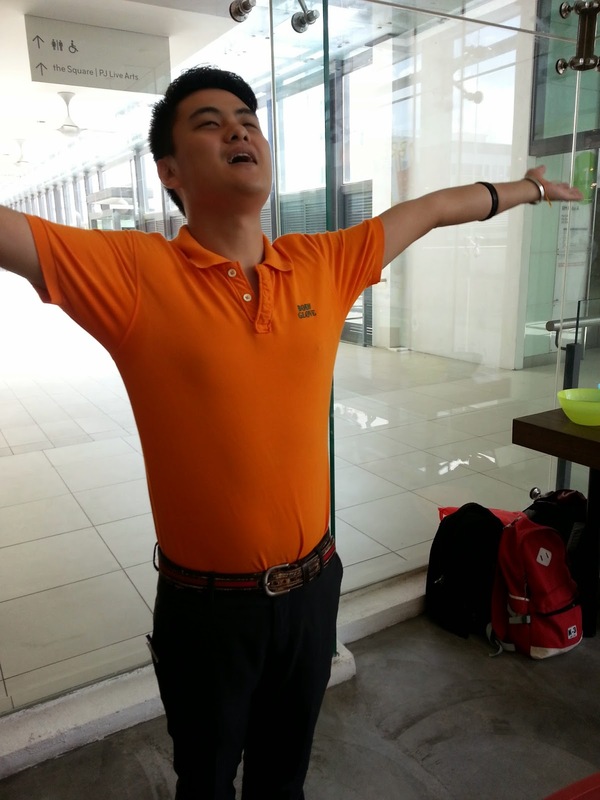 !he is our stretching session instructor! Like Shireen says..all of us look so tense and damn serious. Like me I am the first timer and I want to do a good job!!!! hahahaha...'lesung batu' in front of me??? what??? what??? cannot be you want me to use this stone ages thing, right???? Right??? right?????? we use blender nowadays!!!! 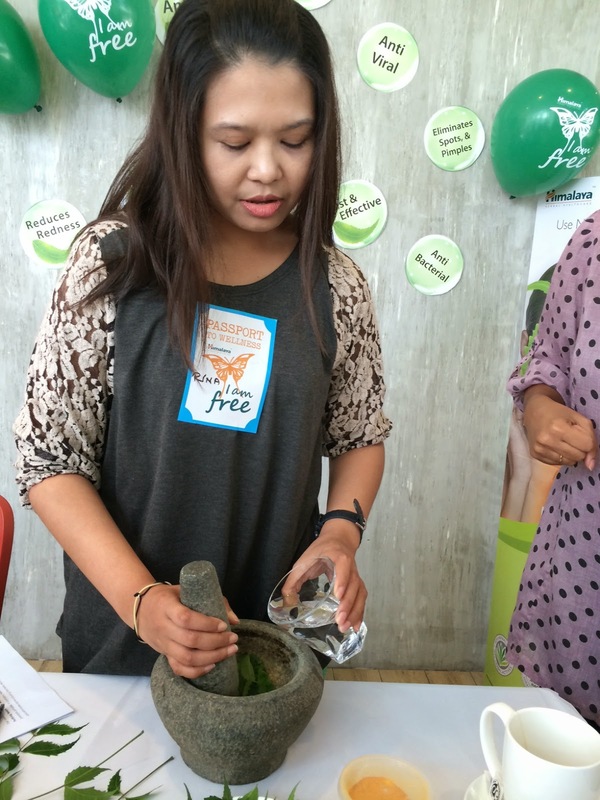 Shireen was explaining the benefit of NEEM Leaf. See the background wall behind my photo??? Thats some of the neem leaves benefits. You see so many leaves lying around in the photos???? That is the real Neem Leaves. 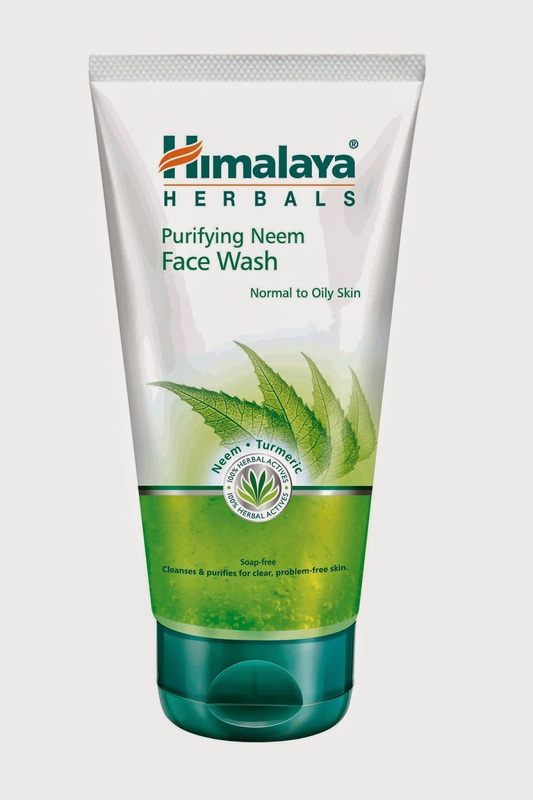 If you have acne problems, neem leaves range will leave your skin silky smooth and pimple free. 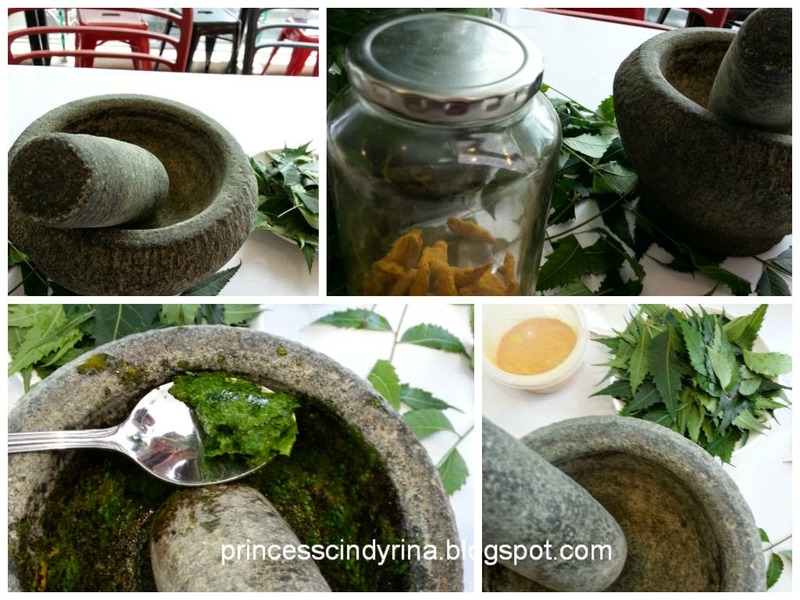 Back during the ancient times, they crushed neem leaves and mixed with tumeric and water then apply onto your skin. They even eat the paste for general health supplement. Pound the neem leaves with turmeric powder ,then eat the paste. What???? you give me prize for that??? I want to feel good and win something today. Me me me me me ....so excited la this Ajuma...she can't even think what waiting...WTH!!!!! Prize is the keywords of all!!!!! isk isk isk ...since when I turn into this kind of person??? So embarrassed to myself just for a while. hehehehe...WTH! I live once yo!!!! Why I need to miss this chance??? There are 2 other Caterpillars volunteer to taste the bitter neem leaves paste. Shireen handed me the 'lesung batu'. Shireen : " Rina going to pound the neem leaves for the other 2 dare devils too"
We need to use the ancient method to taste how the old people maintain their beauty regime. There you go....me the Cinderella of the day!!!! I have not used this stone age fella for more than 5 years... and this is the first time after all those years using the 'lesung batu'. All Caterpillars eyes focus on me....isk isk isk..how should I feel at this point??? I am the center of lime light ...out of sudden. No shivering hand..please...yeay..I need to keep pounding to hide my nervousness!!!! Can I do this on the floor instead of table??? Shireen said I can do whatever I pleased....is this mean I can rolled on the floor too??? kekekeke... another retard thoughts of me ...again??? Yeah!!! baby!!! 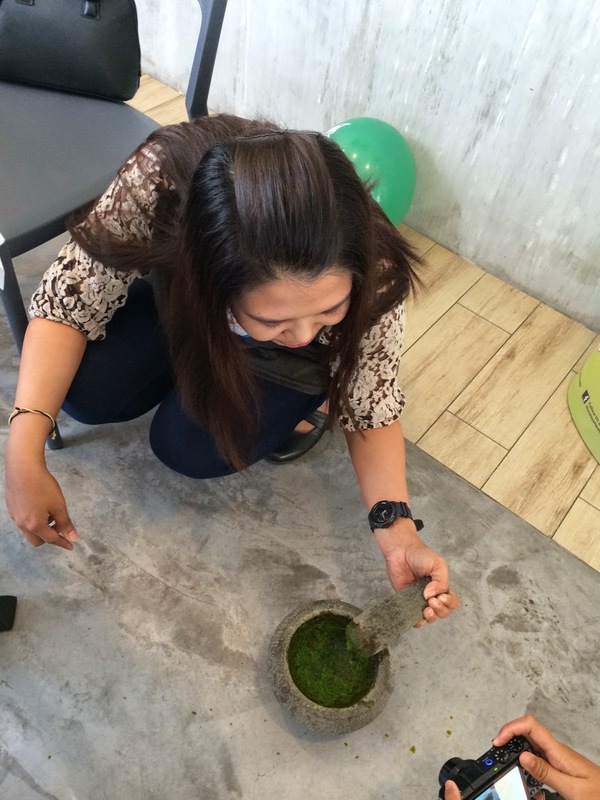 let this Cinderella show you my awesome 'lesung batu' skill. Fuwa Fuwa suddenly filled with the sounds of 'lesung batu'. Yeah!!! me still have that skills, yo!!!! Mummy!!! you must be proud of me!!!! This is all because my Mummy's awesome nagging through out the years!!!! There you go the 'harsh' paste of neem leaves pounded with turmeric powder and water. Asked these three 'DARE DEVIL CATERPILLARS' who innocently volunteered to participate in this FEAR FACTOR, Himalaya style! You see how I stick my name sticker different than the rest of Caterpillars???? Rina I am FREE.....right smack in the middle...kekekeke this is how different am I compare with the rest! I can accept the taste easily...guess my age is old enough to take that bitterness. hehehehe...if I become the 39 years old who still unable to take this kind of taste...ish ish ish..I need to start reflect on how I have been living my life all these years!!!! The Dare Devil Caterpillars each won Himalaya awesome Lip Balm. How to be pimple free with Himalaya??? * A soap free herbal face wash which removes impurities and prevents pimples. * Contains Neem and Turmeric which helps in controlling pimples and eliminates acne-causing bacteria which leaving skin clearer ,softer and supple. Direction - moisten face and massage purifying Neem face wash all over, avoiding the delicate eye area. Then rinse it off with water and pat dry with clean towel. * Combined with exfoliating Apricot granules, it gently scrubs away blackheads, dead skin cells and embedded impurities , leaving you skin soft,clear,refresh and problem free. 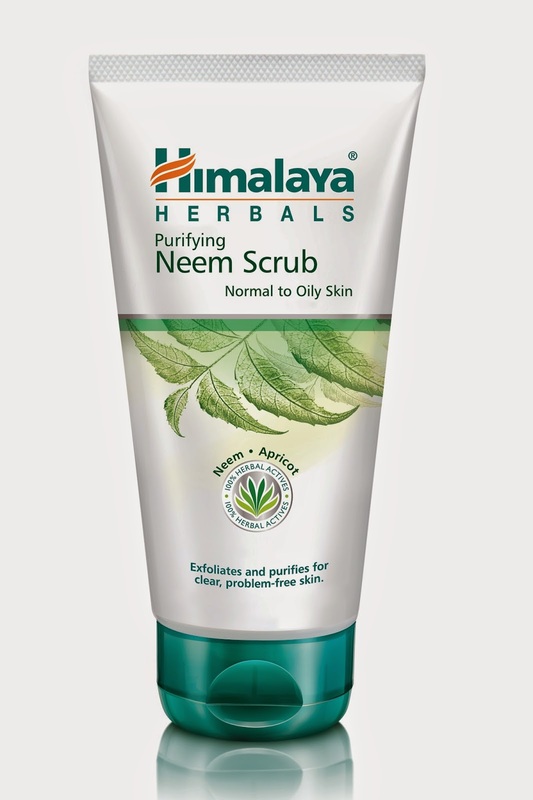 Direction : Apply purifying neem scrub in a circular motion on the face and neck. Rinse with water and pat dry with clean towel. Use this at least once a week for clear , acne free skin. * Helps cleans clogged pores,rejuvenates and firms up skin. * contains Neem antibacterial properties and turmeric which helps eliminate acne causing bacteria while Fuller's Earth cools and soothes the skin. Direction : Cleanse the face and neck . 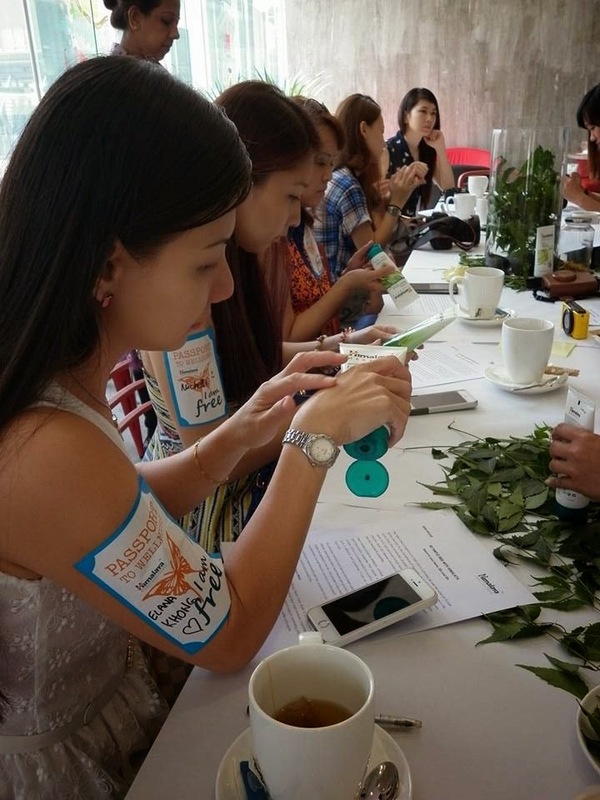 Apply Purifying Neem Pack evenly all over the face and neck , avoiding the area around the eyes and mouth. Let the mask dry for 10 - 15 minutes. Remove mask using wet sponge or towel then rinse off with cool water. * deep cleans the pores and removes excess oil to keep facial skin clean and refreshed. Direction : Add few drops of Deep Cleansing Astringent lotion on a cotton pad and wipe thoroughly over face and neck. I just wrote on full regime to get rid of pimples and acne on face. Not only face part got pimples some of us may suffer on 'bacne' too. Back Acne and this is common issues. Himalaya has a solution for you to have smooth back and body. 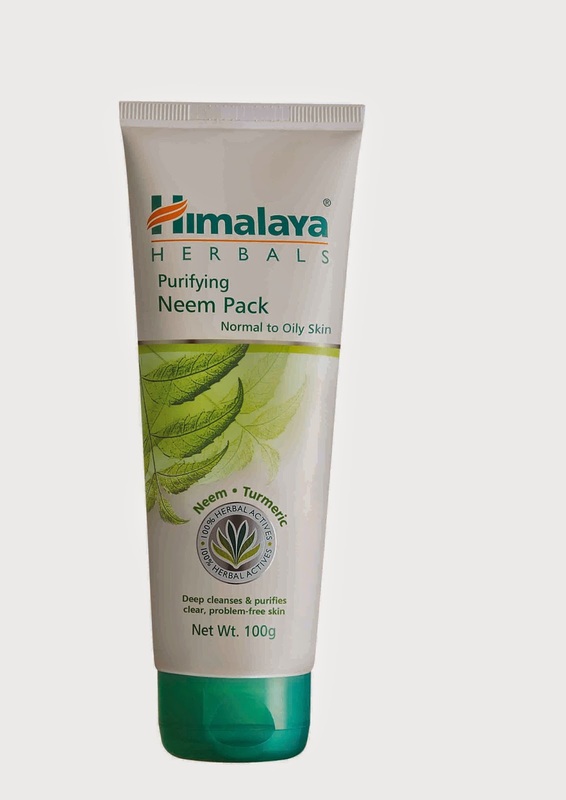 * Herbal formulation with the goodness of Neem and Turmeric to give skin gentle and effective care,clean and refreshed. 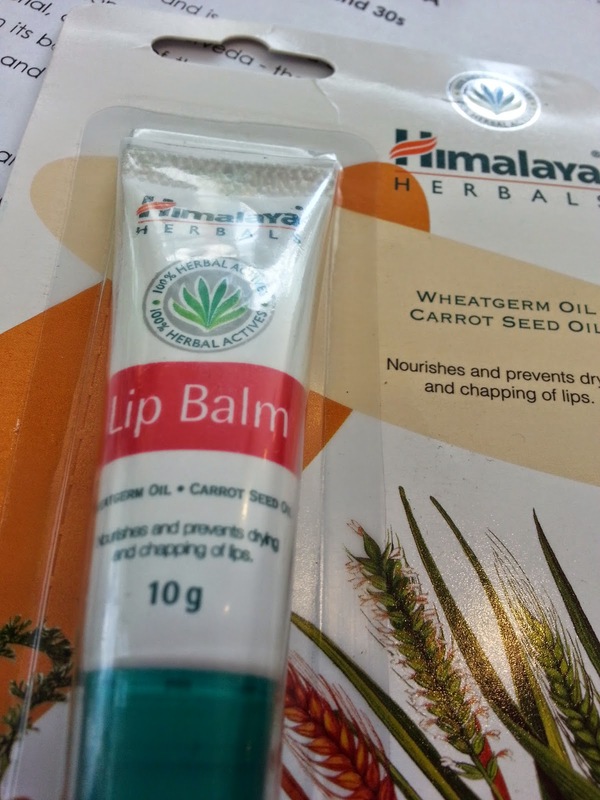 Where to get your Himalaya product??? Gosh!!! 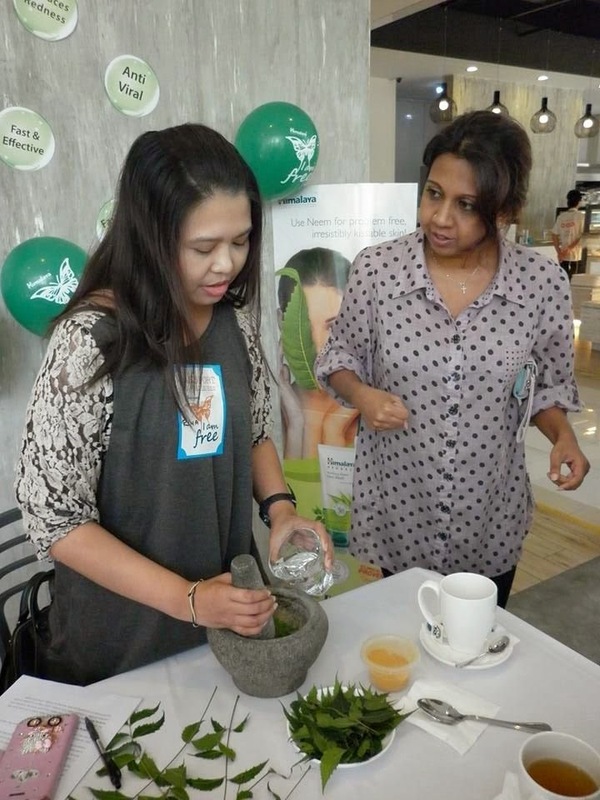 you won't miss them at Watson, Guardian, any famous pharmacies and they even set up specialise Himalaya Herbal Healthcare products boutique - Suria KLCC, Mid Valley Megamall, One Utama and many others. 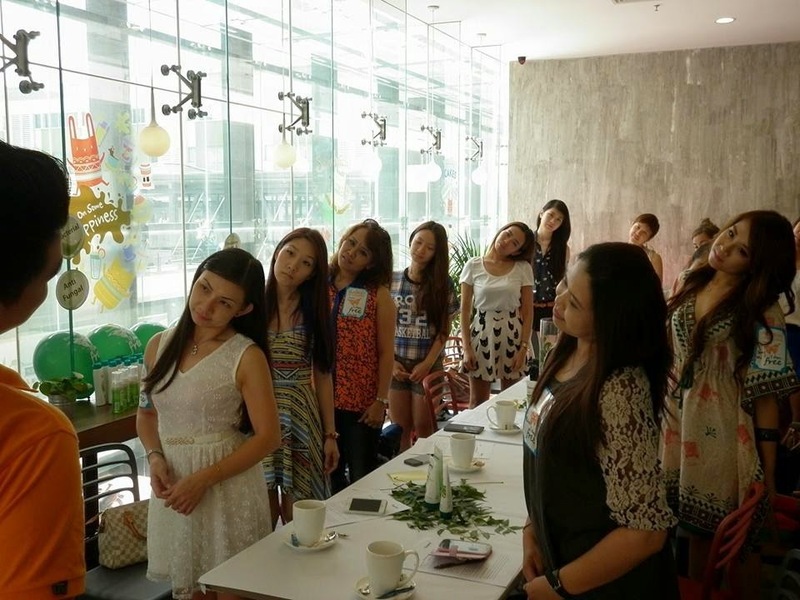 Caterpillars personally experienced the products after the informative briefing by Denise and Shireen. Gosh! never take art in my whole life and last was like form 2...and that was 25 years ago.Gosh !!!! freaking 25 years ago???? Awesome smells delicious Butter cookies sponsored by Fuwa Fuwa Bakery. I finished earlier than other Caterpillars. Never give hopes to win anything....while others still decorating their butter cookies. IMA sat there at one corner staring hard at my finished humble art work....what craps story can I tell to the rest???? Shivering!!!! just to think about need to talk in front of others!!!! I have some ideas from the start but to arrange the story in words...... aisshhhhh..cold sweat running down to my forehead. 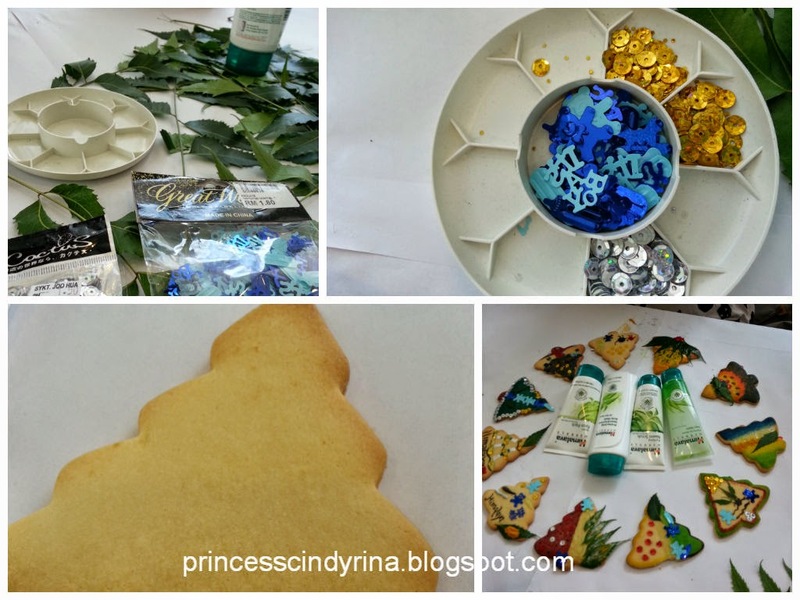 My 'Circle of Life' butter cookies was one of the most creative story. Ahh.....now I discover other hidden strength in myself. Don't laugh at my artwork!!!! Its the meaningful story comes from this ugly one! My heart jumping and jumping and jumping (like that Crayon Pop song)....I won Himalaya Herbals toothpaste and Himalaya Purifying Cleansing Astrigent Toner. WTH!!!! I am so happy woman that day! My selfie with my besties Caterpillar for the day, Elana Khong. She gave out some tips for best selfies. I know she gonna kill me because I published this one.hhehehehehe...kill me Elana and you still look fabulous to my eyes! 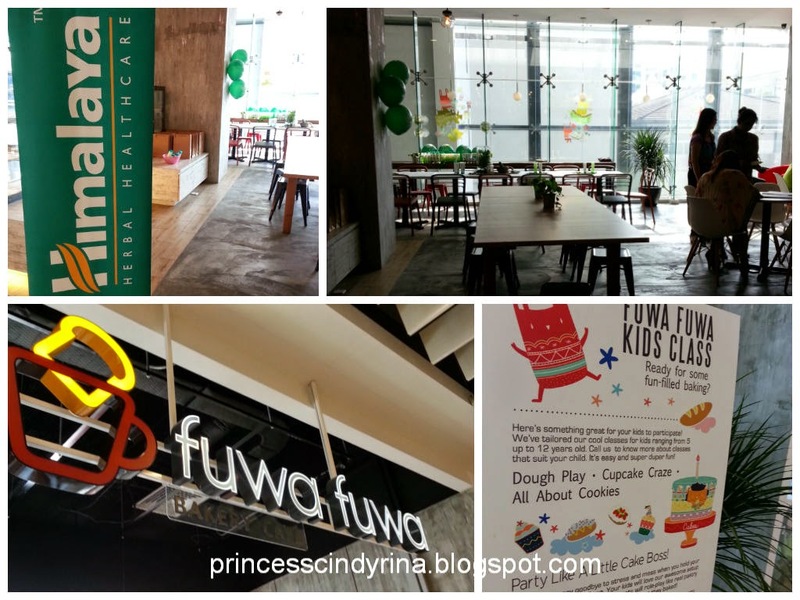 Fuwa Fuwa generously feed the hungry Caterpillars with delicious wholemeal bread sandwiches and awesome meaty sausages. 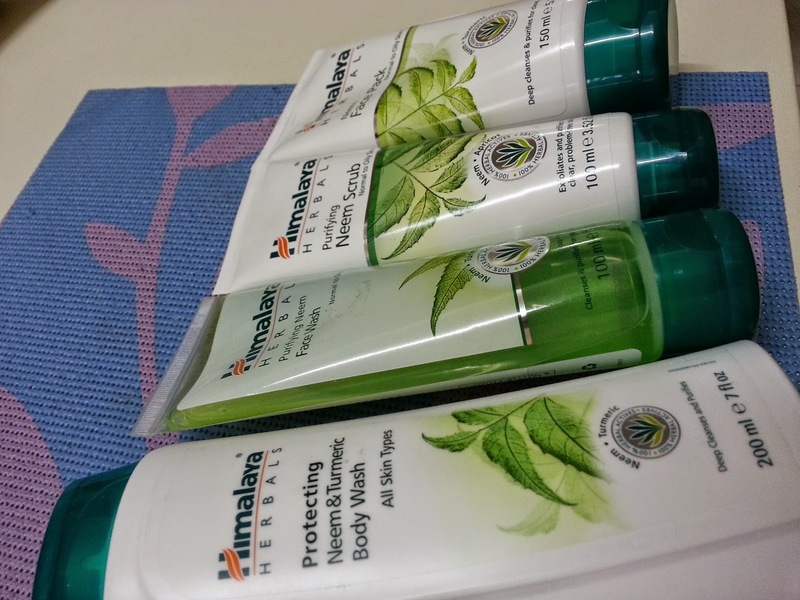 Everybody brought home awesome goodies bag with full sized Himalaya products. 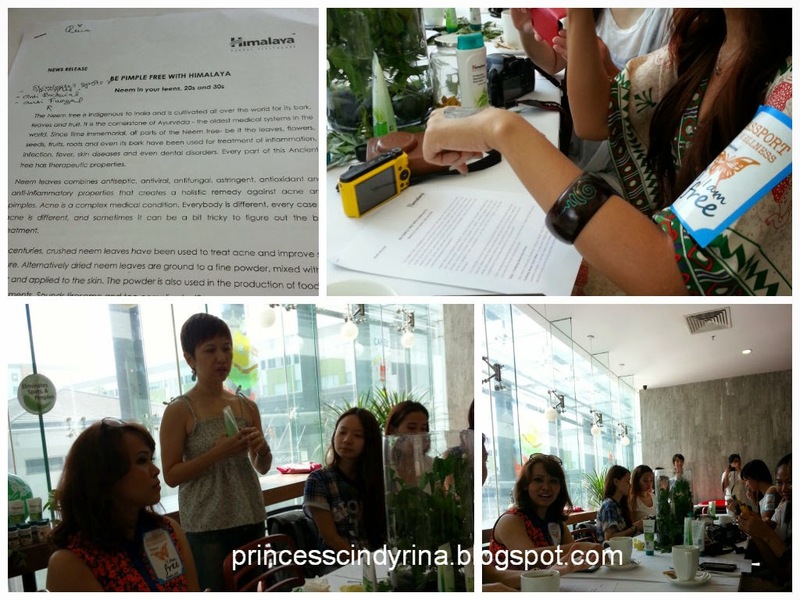 The End of my 'Chongheiness' review of a brunch with Himalaya, Neem Product Review at Fuwa Fuwa, 2nd August 2014. I am thankful to The Project Butterfly who gave me this once in a life time meaningful experience. I give Himalaya organiser 5 stars for included in CD with images of their product range for my write up. They are so meticulous and details. I know I know...my post are too Dramatic!!! But hey..I am the Drama Queen yo! Do you enjoy reading Drama??? Himalaya is the Asian version of The Body Shop. Haha! The Body Shop so nice smells!!! This one so herbs smells wor!!! Hi Michelle! nice to meet you and hope to see you again in other event. Your deco is cute! Haha and so good that you get to try to pound the leaves!! Really interesting event!